Creators of the world’s first table integrated intelligent drop box, IDS directors have over 20 year’s gaming industry experience and recognise the need for real-time reporting on table estate cash position. The core of our product suite is i-depsys, the Intelligent Deposit System, designed to integrate beautifully into your table gaming environment with the purpose of speeding up game play and reducing costs. Integrated into gaming tables, slots and electronic gaming machines faster play, eradicating shrinkage and end of day count and provides “Real Time” information on your casino’s cash position. Intelligent Deposit Systems Ltd have developed the fastest and most accurate note counting drop box in the gaming market. 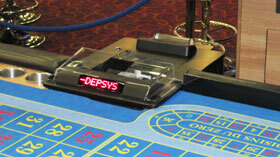 Designed for the table gaming sector the i-depsys unit integrates with any table to replace the traditional drop box. Using optical technology it counts and verifies up to 15 notes a second and can count up to 200 notes. 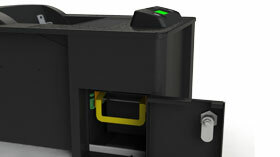 Simple to use the croupiers only have 2 buttons to learn to use and money will be stored securely, dependant on customer requirement, in either a stacker box or tamper evident pouch. The immediate benefits for you are a faster, more accurate drop, which is updated in real time via the networked Intelligent Drop Boxes. This in turn will mean faster game play and increased hold. Next there are efficiencies in security and count room staff. 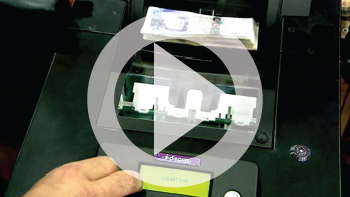 Knowing exactly how much money is in the drop reduces the number of staff required to oversee the transport of cash from the tables to the cash room. If you choose the tru-pouch option you can also eradicate the back office count entirely. 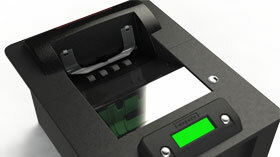 Both models provide the cash office with stacked notes ready to be put straight into the casinos count machines. This alone can save several hours in busy casinos with large drops. IDS have developed a suite of products that are designed to integrate with gaming tables, slots and electronic gaming machines which will speed up game play, eradicate shrinkage, eradicate the end of day count and provide “Real Time” auditable information on your casino’s table and slots cash position.